Graham is an incredibly patient, reliable, kind and gentle person. One of those chaps who says they will do something and you just know it's been done. Someone who is softly spoken, without being afraid to say what they want. A fantastic guy to have around, and about as laid back as Phil Tufnell. Graham also has an excellent sense of humour, every mode of transport you could want (boat, car, bike, bicycle), he knows geeky stuff, and is happy to come to the pub even though he doesn't drink. 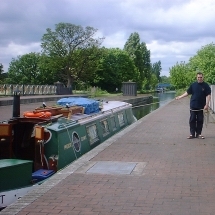 Graham lives on a boat, as seen in the picture. Unfortunately, I know too many Grahams, so I prefer to call him Flossie.